Not your usual Memorial Day weekend. Here’s a conundrum: it’s officially still spring but somehow this weekend has been dubbed the start of summer. Which makes Memorial Day weekend the brunch of the season. Whatever the season, we’re well into the lineup of music fests but don’t be fooled into thinking that the upcoming Saturday/Sunday street party Jubilee is Coachella-on-the-corner. Not that you would be fooled. The greenest of them all…. 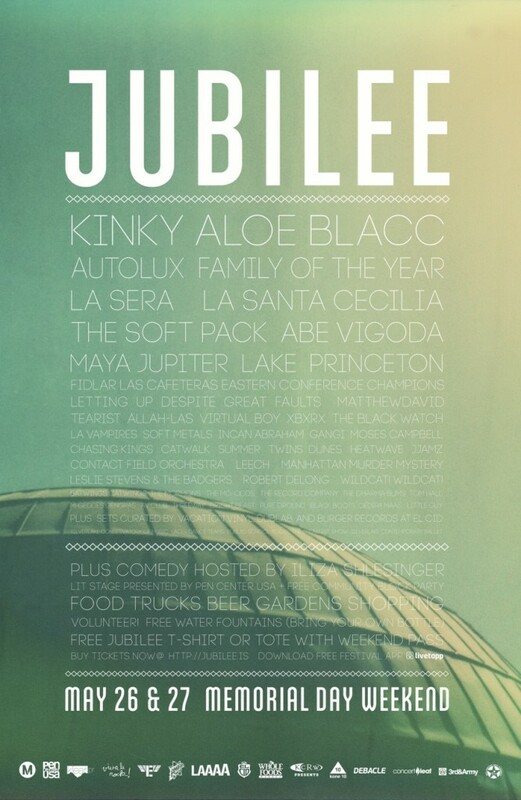 Proving that anything can change its name, the festival-formerly-known-as-“Silver Lake Jubilee” offers up music, of course; look for hometown indie faves like the Allah-Las, Fidlar, Las Cafeteras, Tearist, and Virtual Boy. In addition, the non-profit Los Angeles Arts & Athletics Alliance, which uses profits to fund community endeavors, goes beyond the expected with a full schedule of comedians such as Natasha Leggero, Kumail Nanjiani, and Jonah Ray as well as a literary line-up that includes writers like Ben Ehrenreich, Dirty Laundry Lit, an org that promotes reading (And why wouldn’t you read with that title? ), and Les Figues, whose mission is “to champion the trinity of Beauty, Belief, and Bawdry. Which just happen to be your favorite three B’s as well…. In addition, there’s a FREE Block Party with two stages, kid activities, a huge line-up of food trucks, multiple booze sponsors, shopping, AND the whole shebang is a Zero Waste Event, making it a BYOWB (Bring Your Own Water Bottle) affair. Or as you like to call it…a flask. Much art; no buckets of blood. Are your Prom Night memories more cringe-inducing than magical? 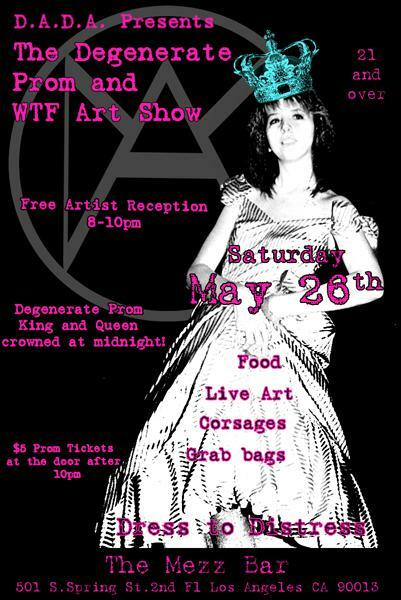 The Department Against Degenerate Art (DADA) helps you rewrite your Bad Hair/Dress/Date history with Saturday’s Degenerate Prom and WTF Art Show. For one thing, you get to choose your date. More costume party and alt-art celebration than not-so-fun Rite of Passage, the event at the DTLA Mezz Bar starts with a FREE Artists Reception from 8-10pm featuring dozens of alt-artists then morphs into a super-cheap ($5) prom. The first 50 people get a “degenerate art grab bag”. (Ooh, want, want.) Food, a full bar, and Degenerate Corsages and Boutonnieres will be available. Go Go’ers, don’t count on a carnation. Attendees are encouraged to “dress according to your most demented dreams”; Naomi Coronel will immortalize the results in prom pictures. A non-gender-specific Prom King and Queen will be crowned at midnight and unlike high school, special prizes will be awarded. Finally, the “Best Tuxedo T-Shirt” award you’ve always craved. Sure, Target’s your fave spot for shower curtain shopping but for an even better art-and-design-centric event, check out Target’s Free Holiday Monday at LACMA. Don’t expect to buy a blender. 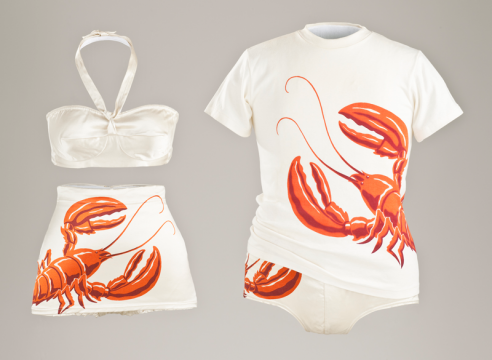 Want a glimpse into back-in-the-day Memorial weekends of outdoor living and lobster-adorned leisure wear? 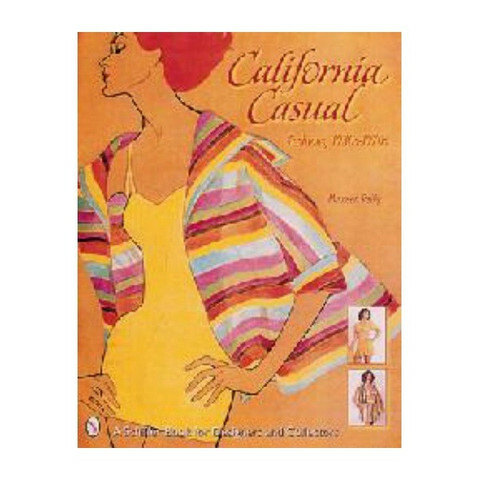 Then be sure to check out California Design, 1930-1965:” Living in a Modern Way” exhibit, which closes next weekend. Also closing next weekend, Robert Adams:The Place We Live features Adams’s photos of the American West, including Los Angeles in the post-WW II construction boom years. Think of it as the Before and After exhibits. The May 28th event has a component geared toward Cultured Tots and their doting Parentals. Free tickets to the Boone Children’s Gallery on Target Free Holiday Monday will be timed and distributed on a first-come, first-served basis on the day of the event. Timed tickets allow for a thirty-minute visit. In case you have a kid with that attention span. And whether you’re a kid, a kid at heart, an architect, an urban planner or just appreciate fantastic design, don’t miss Chris Burden’s gallery-sized Metropolis II: a complete city system that’s less Legoland, more City of the Future. A City of the Future where Sprummer will undoubtedly be celebrated.